I did this walk on the 11th March 2007, taking the tube to Turnpike Lane Station. After lasts weeks torrential rain it was a gloriously mild sunny day and I had wanted to continue my walk around the Hertfordshire Way however my car has been affected by the contaminated petrol and was not in a fit state to be used. Thus I had to settle for somewhere accessible by public transport and it made sense to finish off my walk along the New River Path although the weather really did cry out for a trip to the countryside. From Turnpike Lane station it was .68 mile to rejoin the New River Path from where I had finished last time although this includes a detour back up to the New River itself rather than just to Wightman Road where I had finished the last stage. When got back to the New River I took a photo of the river as it passes under the railway lines, photo 1, before heading off along Wightman Road. A short distance further on the route turns right up Hampden Road to rejoin the New River itself, photo 2. Unfortunately the route is only able to run alongside the New River for a short distance before it is forced to rejoin Wightman Road, photo 3. This is followed for some distance down to Endymion Road where the route turns left before rejoining the New River to the right as it enters Finsbury Park. The New River makes its way across a corner of Finsbury Park, photo 4, heading towards Green Lanes. Crossing over Green Lanes the route of the New River path links up with the route of the Capital Ring as it continues down besides the river on a rather boggy section of path. To the left there were good views across the Lea Valley, photo 5, to the right the tower blocks of the Woodberry Down Estate. The path follows the New River round to cross the Seven Sisters Road before once again rejoining the riverbank as it leads round towards the East and West reservoirs at Stoke Newington. Crossing Newnton Road the New River Path enters the East Reservoir, photo 6. On my wak along the New River Path I had seen a number of cranes that are used to remove rubbish from the river and as I was passing the reservoir one was in operation, photo 7. Sliding down to pick up waste material collected by a sluice and then lifting it up to slide along a metal beam to release the contents in a heap besides the river bank. I couldn't see anyone nearby operating the machinery so I guess they might be operated remotely. Continuing round the side of the East Reservoir, which marks the current terminus of the New River, the New River Path crosses Lordship Road and making its way round the West Reservoir which is now used as a sailing centre, photo 8. The path follows the New River round the side of the Reservoir to what is now know as the Castle Climbing Centre, photo 9, but which was once a main pumping station for the New River. Here, once again at Green Lanes a signpost shows it as being 25 miles back to Hertford. The New River path now has to head over roads and small open spaces as it follows the remainder of the original route of the river course to New River Head which is now almost entirely built over. The route heads down Green Lanes before turning left into Clissold Park, photo 10. There were a number of fallen down trees in the park from the recent storms which reminded me of when I had lived next to the park during the great storm of October1987 when numerous trees had been blown over. I took a slightly circuitous route through Clissold Park making my way down to Stoke Newington Church Street before crossing into Clissold Crescent. Almost immediately the route heads down Aden Terrace on the right, past a thin strip of allotments built over the course of the New River, photo 11. At the end of Aden Terrace the New River path heads across Green Lanes again and continues down Petherton Road, photo 12. The route of the New River forms a green island that runs down the centre of the road. Although it was still early March all the daffodils were in bloom in this thin strip of urban green space. This stretch of the new River had been covered and piped in 1870. From Petherton Road the continues on into Grosvenor Terrace and Wallace Road, past Canonbury British Rail Station. The path crosses St Pauls Road and heads down besides a stretch of the New River that has been turned into a thin strip of ornamental Gardens called New River Walk, photo13. The path continues alongside the New River Walk, parallel with Canonbury Grove, where there is an old 18th century watch hut, crossing over Canonbury Road to reach Essex Road. There are a number of signboards giving details of the New River and in etched into the path, just before Essex Road is reached is a diagram depicting the route of the New River. Most of the junctions are marked with small, green, New River Path markers making the route relatively easy to follow although in one or two places these were missing. The route heads to the right down Essex Road before turning to the left down St Peters Street, and then almost immediatley to the right, into Colebrooke Row, photo 15. The route heads down Colebrooke Row to City Road. 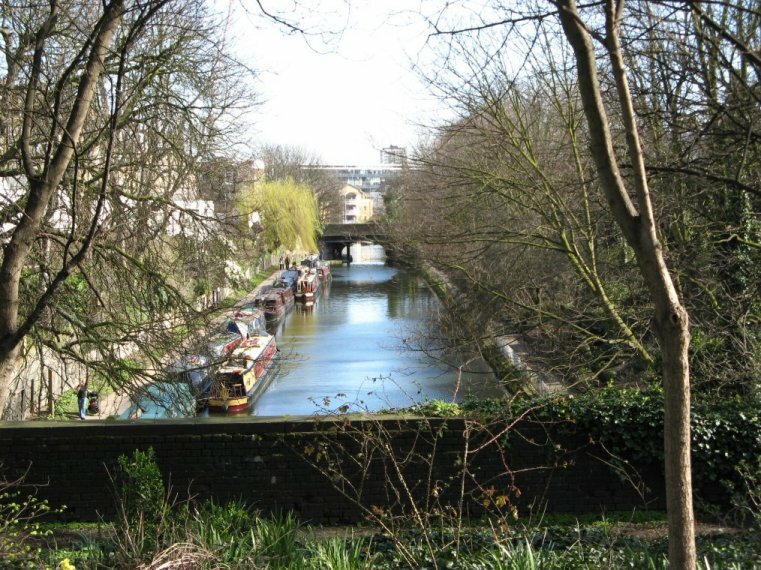 On the way, the route of the New River Path crosses high over the Regents Canal close to where it emerges from the East portal of the Islington Tunnel, photo 16. Crossing City Road and the top of Goswell Road the route heads besides a small park to cross St John Street, photo 17, and head into Chad Street before turning left into Arlington Way. The route then turns down Myddleton Passage, next to the Shakespeares Head pub in Arlington Way, to reach the end of the walk at New River Head, photo 18. At New River Head there is a small viewing area enclosed by metal railings that overlooks the site. Whilst many of the historic features are no longer present the site is still in use today and is the location of one of the boreholes for the Thames Ring Main.The building in photo 20 was built in 1919 was the headquarters of the Metropolitan Water Board and was built on part of the site of the Inner Pond where water from the New River used to arrive, although it has now been converted into flats. Around the viewing area are a number of information boards giving details of the history of New River Head and of the New River and path itself, photo 21. The total distance I walked from Turnpike Lane to the New River Head in Islington was 6.0 miles. This gave a total mileage for the walk of 31 miles, including my diversions to and from Cheshunt and Turnpike Lane Stations and detour round Enfield. The walk had taken me from the Hertfordshire countryside into the centre of London. The original route of the New River dropped only 5.8 metres in height from start to finish and thus this walk was generally flat, the only real exception being at Carrs Lane in Enfield. It was easy walking along the riverbank although this was very muddy in places (probably not so much of a problem later in the year). There was also a fair degree of walking along pavements on the later stages and sometimes the continued diversions away from the river bank were a bit irritating. The walk is generally well signed and features a fair number of information boards along its route although I did get caught out by the odd missing signpost from time to time. The route is marked on the information boards and I made sure I looked at each one to be sure of where I was heading. The riverbanks for much of the course of the New River have been built upon and this often restricts the views that are available. It was however an interesting walk and there was still plenty to see on a very historic route. As this had been a fairly short walk I walked up to Angel tube station, which is the nearest to New River Head, and took the underground to Paddington and walked along the Regents Canal to Limehouse, crossing over the route of the New River in Colebrooke Row in the process.